For some reason, 2013 has been one of those years that’s reminding me I’m getting older. As an avid film fan, it’s probably something to do with the fact that 1993, a great year of films for seven year olds, was 20 years ago. Yep, I’m afraid to remind you that as of this year Mrs Doubtfire, Cool Runnings, and Robin Hood: Men in Tights to name but a few, are all 20 years old. Theatrical poster for ‘Super Mario Bros’, Rocky Marton & Annabel Jankel, 1993.
Credit where credit is due though, in 1993 Jurassic Park set the record for highest grossing film. I’ve never quite agreed with measuring a film’s (or anything’s) success with money, but considering it’s ground-breaking physical effects are still better than many modern CGI efforts, the forthcoming Jurassic Park 4 notwithstanding, it’s not hard to see why they’re giving it the 3D treatment. 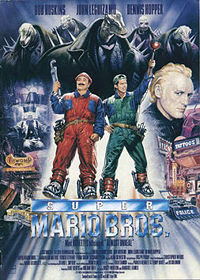 Super Mario Bros. on the other hand didn’t exactly wow many critics or cinema-goers, but in the spirit of fair play, it was the first of a whole wave of Hollywood Video Game adaptations that haven’t exactly fared much better. The very next year Japanese and Western audiences were each given their own Street Fighter film, which the last 19 years have given both the time to be seen worldwide. The resulting opinions seem to suggest that Hollywood’s Jean Claude Van Damme offering was K.O’ed by it’s anime counterpart. As the years came and went, so did films such as Mortal Kombat, House of the Dead, and Alone in the Dark. Don’t worry, I haven’t seen them either. But this is not to say that all video game films are worth avoiding, or haven’t at least contributed something to modern cinema. Final Fantasy: The Spirits Within might not have been what audiences were expecting, but the sophistication of its photo-realistic animation garners nothing but respect. Likewise I can think of much worse summer action movies than Lara Croft: Tomb Raider. Even with a last minute sci-fi time travel twist, it still received much less flack than the aliens of Razzie winning Indiana Jones and the Kingdom of the Crystal Skull. With so many films receiving so many mixed reviews it’s hard to say which has fared the best, though perhaps one that stands out the most is 2002’s Resident Evil. Where others have been faulted for either staying too close or straying too far from their playable counterparts, writer/producer/director Paul W.S. Anderson instead decided to take it in another direction. From a game famous for it’s suspenseful horror and nerve shredding atmosphere, the film places emphasis on action instead, and even does so without the need for running ‘zombies’. The result is a film which not only keeps in plenty of the game that the audience love, but gives it enough of a twist to keep it fresh. ‘Tekken’ was never given a theatrical release in the U.S. Between its failures and moderate success’s though, it doesn’t seem as though Hollywood has learnt much over the past two decades. 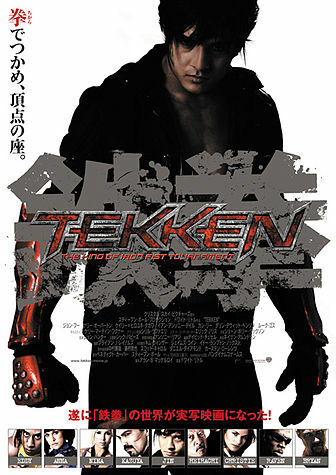 Resident Evil has since jumped the shark with four (so far, more on the way) sequels, Street Fighter‘s player two, The Legend of Chun-Li, barely even pressed the start button to join in, and the only U.S. screening of 2010’s Tekken was to prospective distributors. Needless to say, none felt that entering the Iron Fist Tournament was worth their effort. Despite this however, Hollywood’s films keep on coming, with Assassin’s Creed and Metal Gear Solid reportedly in development. But given its reputation, it’s not surprising that the Japanese games makers themselves are increasingly producing CGI films themselves. Final Fantasy VII: Advent Children and Resident Evil: Damnation are aimed almost exclusively at gamers, fit into the games’ continuity transmedia style rather than rebooting, and were released straight to DVD. It seems to me as though they’ve found the right way to go about it. Taking all this into consideration then, from a general perspective if not Bob Hoskins’, does Super Mario Bros. really deserve the bad reputation its been chained to all these years? First things first, the Mario games were more than likely chosen for being a well known name than having an adaptable storyline. The basic premise of ‘hero rescuing princess trapped in a castle’ isn’t exactly the most original, even if Mario is the first plumber to do so. Also using this age old fairy tale however, is the other still long running Nintendo franchise, The Legend of Zelda. 1993 saw the release of the series’ fourth title Link’s Awakening, and by nature of being an RPG as opposed to a run and jump platformer, each offered much more in terms of quests, adventure, and more importantly, characters that were only two dimensional in terms of pixels. And here is perhaps the first misconception. Looking back it is easy to assume that a simpler backstory to adapt naturally gave the film-makers the attractive prospect of more freedom to explore the Mushroom Kingdom; but with such an assumption comes the wonder where Dinohatten and even dinosaurs came from? With The Princess Bride made six years previously, it’s not as though such a fantastical medieval film, turtles included, wouldn’t have been practical. But when you consider this point is backed up by the all too similar Teenage Mutant Ninja Turtles III, a film released just two months before Super Mario Bros., in which the titular turtles travel to feudal Japan, you can’t really blame the film-makers too much for going in another direction. Even if that direction wasn’t Zelda. As mentioned before though, Mario video games are simply more popular, and therefore a bigger name to draw in the crowds. But they are still video games. Unlike the books and TV series which were also being adapted, adapting a film from games was always going to be aiming at a niche audience, something which still holds true today. I’m not saying they’re mutually exclusive so forgive me for generalising them, but gamers are going to be less concerned that a film is adapted from a book, than readers towards a film from a game. In terms of storytelling at least, books have a centuries old reputation of being grown-up, even cultured, and moving. Video games on the other hand were looked down upon just for being what they are, games. Not only this, but generally speaking, the less sophisticated the game (ie: mere running and jumping), the younger the audience they are seen to be aiming for. Whether this is the case or not, its fair to say its how they are perceived. Added to this is the fact that the more an audience enjoys something the more critical they will be of its film. After watching one of their adaptations you can instantly tell who’s read a Harry Potter book, simply because the first thing they’ll say about it is everything that was missed out. Mario’s job of pleasing audience members is an uphill struggle even before the outline becomes the screenplay. A screenplay with which you also have to acknowledge the compromises made to contemporary Hollywood. Between a choice of Bob Hoskins and John Leguizamo, it was always going to be Leguizamo taking the romantic lead in a film aimed at the kids to twentysomethings demographic, so I’m afraid the switch of Peach for Daisy is somewhat justified. The dinosaur being called ‘Toad’ on the other hand, isn’t. And that’s where the next problem comes, Bob Hoskins and Dennis Hopper. Obviously I’m not saying I have a problem with Hoskins and Hopper, far from it, just that I’m agreeing with them when they say they regret having done it. Kids watching the film in cinemas, may have recognised Bob Hoskins as Smee from 1991’s Hook, Dennis Hopper probably not at all, but their accompanying parent’s would obviously recognise them a lot more. The Long Good Friday, Blue Velvet, Easy Rider, all are respected films that bestow upon their actors a sense of class, which in turn give audiences expectations. Expectations that this film was never going to live up to. Script and cast aside though, lets look at the production values. Not the worst certainly, but it wouldn’t surprise me if Mario’s Dinohatten was actually a hand-me-down Mars from Total Recall. As for the CGI, it’s no surprise that co-directors Annabel Jankel and Rocky Morton’s only other recognisable creation (then, and even now) was Max Headroom, which would explain their being chosen to attract the MTV generation. Gripes notwithstanding, its two Saturn Award nominations for best costume and make up were well founded. Like the games that preceded it, ‘Dead or Alive’ focused heavily on the visuals. Weighing up the pros and cons, it’s fair to say that twenty years later, Super Mario Bros. is still a bad film, but that doesn’t matter. And even if it did, that’s precisely the reason why it’s brilliant. Yes, the fact it makes me feel old does add to it’s nostalgia factor, simply by reminding me of being a kid, but more than that you have to remember it’s primarily a kids film. Adaptation or otherwise, kids films are always going to stand the test of time better, not just because they’re silly, but because they’re meant to be silly. Script and casting are always going to be hard hurdles to jump, and that’s where the majority of video game films fall down. But if you can look past those, the dated effects only add to its charm, and while it may not have had D.O.A. : Dead or Alive‘s forethought to not take itself seriously (disclaimer: not a kids film), when looked at in the same vein I don’t think you can deny that Super Mario Bros. is pop corn munchingly, brain meltingly, silly.